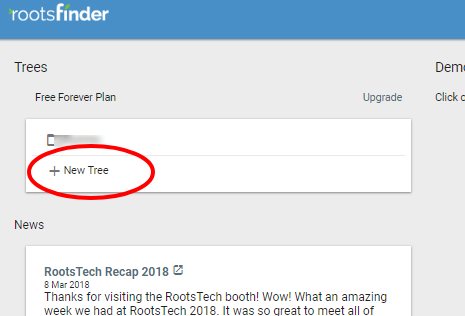 If you did not start your tree when you registered, Click on "RootsFinder" in the upper left of your screen. Then click on "+ New Tree" on the left side. 1. Give your tree a name. 2. Choose whether your tree will be public or private. 3. Click on Import a GEDCOM. 4. The "GO" button will turn blue when you have completed 1-3. Click on the blue Go button. Complete the fields on this next screen. 1. Select a GEDCOM file. 2. Enter the name of the root person. This is the person you want at the beginning of your tree. Also enter the birth date of that person. 3. The "GO" button will turn blue. Click on the the blue "GO" button. Your GEDCOM will be uploaded shortly, depending on how large and how many GEDCOMs are ahead of yours in the queue. It usually only takes a few minutes. You can wait or close the tab. An email will be sent to you when your import is complete. 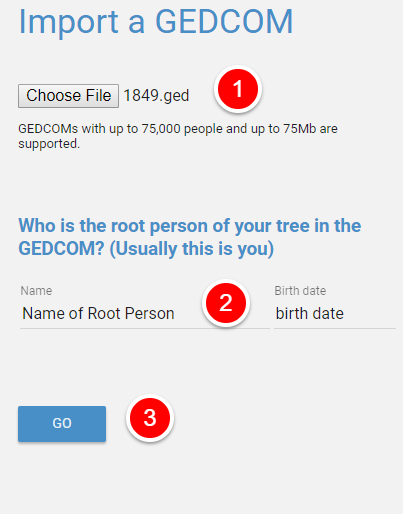 Once you've started a tree at RootsFinder you can't (at this time) import a GEDCOM into it. 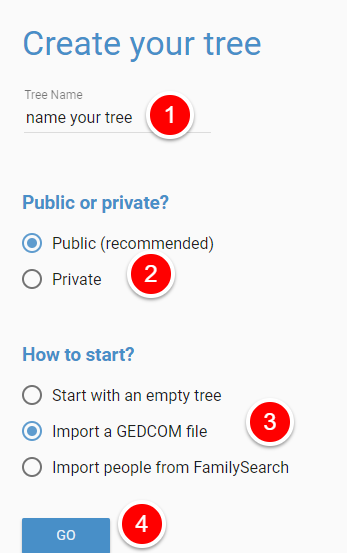 If you would like to import a new GEDCOM, you'll need to start a new tree.